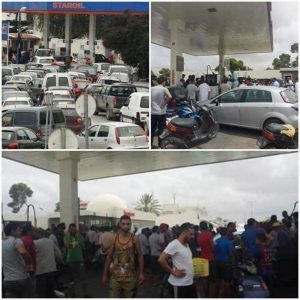 Tunisians queueing at petrol stations near the Libyan border region caused by the Libyan border closure and clamp down on Libyan subsidised fuel smuggling (Photos: Fuel & Gas Crisis Committee). Libya’s continued anti-smuggling efforts of its subsidised goods into its neighbouring state Tunisia is causing some diplomatic tensions. Milad Al-Hijrisi, the Chairman of the Fuel and Gas Crisis Committee of the Brega Marketing Company, a wholly-owned National Oil Corporation subsidiary, confirmed that the ‘‘Libyans were entitled to protect and secure their wealth and assets from smuggling operations’’ and entitled ‘‘to combat the smuggling of fuel from Libyan territory and to deal with this phenomenon, which threatens the country’s economy’’. Speaking yesterday to the Tripoli-based official state news agency, LANA, Hijrisi said that “the security services are determined to deter this phenomenon and to stop smuggling operations that target the wealth and sustenance of Libyans everywhere across the Libyan territory, on its borders and all its outlets”. Referring to the Ras Ajdir border crossing, which has been closed for days on the backdrop of protests and roadblocks at the Tunisian border town of Ben Guerdane and whether the Libyan Fuel and Gas Crisis Committee had been in contact with the Tunisian authorities on the matter, Hijrisi said that the Libyan side, had the right to protect their wealth and their citizen’s assets. With reference to reported Libyan-Tunisian diplomatic tensions as a result of the border closure, he added that it was within the functions and duties of the Fuel and Gas Crisis Committee, and that it was a legitimate right guaranteed by Libyan law, and that this function had nothing to do with foreign affairs or foreign communications, asserting that matters of foreign affairs were an inherent right of the Libyan Ministry of Foreign Affairs and its competences. Hijrisi’s comments come on the backdrop of rising tensions across the main Libyan-Tunisian land border as Libyan anti-smuggling efforts have taken effect over the last year. The Fuel and Gas Crisis Committee has reported that it has received death threats to its members from within Libya over the last year as its efforts have taken effect. Libyan vehicles and ambulances have also been attacked by angry Tunisians affected by anti-smuggling efforts and the border closure. The success in preventing goods and specifically subsidised goods led by fuel, has caused huge queues at Tunisian petrol stations just the other side of the Libyan border. Tunisian TV footage has shown Tunisians complaining that they are unable to survive in the poorer southern regions of Tunisia without the Libyan border crossing being open. The border crossing has remained closed after Libyan vehicles were harassed or attacked. It was reopened briefly on the orders of the Faiez Serraj government’s Foreign Ministry after pressure from the Tunisian authorities in an effort to avert a crisis at its border region. However, renewed attacks on travelling Libyan vehicles led to the re-closure of the border except for ambulances.